The Ricky Frank School of Enameling is founded on the principle that enameling and in particular the technique of Cloisonne´ does not have to be complicated. I have been able to "de-construct" the process into small steps so that even a complete novice will be able to create breath-taking enamel pieces after only a few days of classes. I strive to meet all students at whatever level they are on, and share my passion and all of my knowledge about this incredible art form. I teach in my home studio which is located in Marietta, Ga, a suburb north of Atlanta, Ga. I am about 45 minutes from the Atlanta airport, and there are plenty of hotels and restaurants within 15 minutes of my studio. I can email you a list of hotels and directions. Most of the classes I teach are 2-3 days in length, usually over a weekend. I also teach several 5 day intensive classes throughout the year. Class size is limited to 5 students, keeping it nice and small so that students will have all of the personal attention they want and need. This allows students to pursue a more individualized program of study once they understand basic principles. I teach differently than most teachers, and break all of the rules found in books about enameling. For this reason I prefer that students new to my classes take some form of "Introductory" class with me so that we are all on the same page and speak the same language. A 5 day class always begins with at least some review of basic principles. The average cost of a 2 day workshop is $300 per student. I supply all of the materials and tools you will use throughout the class. Small enameling tools are also supplied so that you don't need to purchase anything prior to the class. You can purchase these tools from me at the end of the class if you like them, but it is not required. I also sell larger tools for the enamelist and jewelery during the workshops, offering great discounts to my students. This includes Foredom (think flexible shafts), Paragon Kilns, and the JoolTool grinding/polishing system. We can create a class together to satisfy your needs. Bring along a group of friends, or come for a Private class. One day or more, design your own learning process with my guidance. Price Quotes are available by email or phone. Many beginning students like to take my 2 day "Introduction to Cloisonne´" workshop. Students will learn the basic technique and principles necessary to create a Cloisonne´enamel with deep, transparent colors. Steps include preparing fine silver to reflect light through the firing process, wirework basics, color layers/color gradations, and final grinding/polishing. With each step students learn the principles involved so that when they return to their own studio they will understand the "what, why, and how" to the process. Students will make two sample projects designed by Ricky in order to focus on the steps and principles. This helps removes a student's fear of "not being a good enough artist". Art (design, expression, and creativity) come after the basic building blocks of technique have been learned. 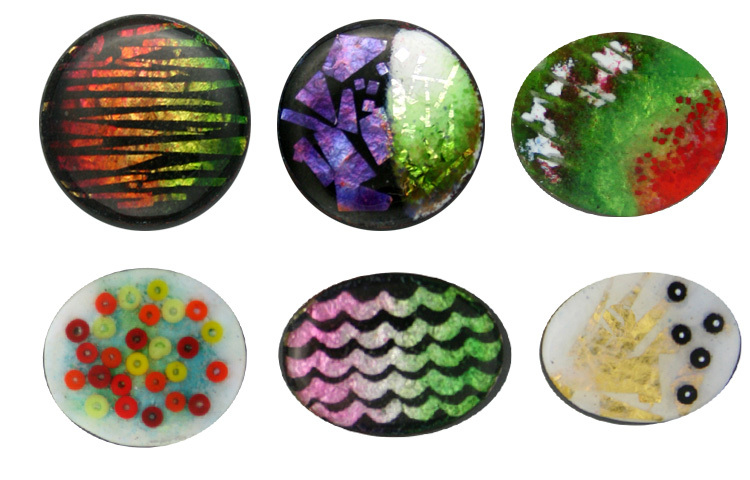 Creating enamel gemstones with transparent & opaque enamels. This workshop is similar to the Cloisonne´workshop but without the wirework. ﻿Special emphasis is on the use of silver and gold foils to create texture and pattern within the enamel layers.﻿ Students will learn basic enameling principles (sifting, painting, counter-enameling, firing, finishing) as well as creative approaches to layering transparent, opaque, and opalescent enamel colors. This is a fun, fast-paced class and students make many samples of their own design. These techniques can also be applied to many of your metal clay designs, so it is an ideal class for metal clay artists wishing to add color to their work.